This module is the last in the Brain Power! program. 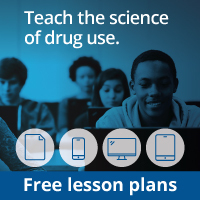 Over the past five modules, your child has thought about society’s views toward drug use and has learned about the structure of the brain, how neurotransmission works, and how stimulants, alcohol, marijuana, and inhalants affect the brain, the nervous system, and the body. During this module, your child will learn about addiction. He or she will then revisit the ideas about how society views drug use and modify his or her thinking based on new knowledge. Compulsive use: A strong compulsion or drive to use drugs despite negative consequences. A person persists in using drugs even if he or she is having serious problems. Tolerance: The person needs more of the drug to produce the same effect as before. Withdrawal: Intense craving for the drug when it is not available. Once a person is addicted, he or she must have the drug just to keep from feeling bad. This is because drugs can cause changes in the functioning of neurotransmitters in the brain. This activity aligns with the following standards identified in the NSES: science and inquiry and science in personal and social perspectives. The students experience some of the steps in the process of scientific inquiry: developing a hypothesis, completing an investigation to test the hypothesis, and drawing conclusions. Students also learn about the effects of several different drugs on the brain, the body, and the nervous system. They discuss the impact this information has on their lives and how they can use it to make wise decisions about their own health. Talk to your child about addiction. Talk about the effects that addiction has on people’s lives. Revisit the original question addressed during Module 1: If people know how bad drugs can be, why do they still use them and abuse them? Have your child use the space below to write down the answer. This Web site was developed to educate children about the biological effects of drug abuse on the brain and body. Focus on Drugs and the Brain. [Friedman, D.] Frederick, MD: Twenty-First Century Books, 1990. This book, part of the “Drug-Alert Book” series, includes a section on each drug of abuse and addiction.